in St Hyacinth Church, Glen Head, New York. Mention St Francis of Assisi and many people think of animals, on account of his seeking to live in love, humility and harmony with the whole of creation. His attitude towards animals has justifiably given rise to the blessing of pets on this his feast day. Unfortunately, however, he is often confined to the world of sentiment, diminishing him and trivialising his message. An evangelical Catholic with a broad vision of creation and redemption, Francis was devoted to Christ crucified, from whom he received his vocation to rebuild and renew the Church in such a way that ordinary people are loved into its koinonia. As an antidote to some of the well-meant sentimentality of this day, I share with you the end of G.K. Chesterton’s St Francis of Assisi. Slightly dated, it is still an amazingly perceptive essay on the greatness of Francis. The entire work can be read HERE. He was above all things a great giver; and he cared chiefly for the best kind of giving which is called thanksgiving. If another great man wrote a grammar of assent, he may well be said to have written a grammar of acceptance; a grammar of gratitude. He understood down to its very depths the theory of thanks; and its depths are a bottomless abyss. He knew that the praise of God stands on its strongest ground when it stands on nothing. He knew that we can best measure the towering miracle of the mere fact of existence if we realise that but for some strange mercy we should not even exist. And something of that larger truth is repeated in a lesser form in our own relations with so mighty a maker of history. He also is a giver of things we could not have even thought of for ourselves; he also is too great for anything but gratitude. From him came a whole awakening of the world and a dawn in which all shapes and colours could be seen anew. The mighty men of genius who made the Christian civilisation that we know appear in history almost as his servants and imitators. Before Dante was, he had given poetry to Italy; before St Louis ruled, he had risen as the tribune of the poor; and before Giotto had painted the pictures, he had enacted the scenes. That great painter who began the whole human inspiration of European painting had himself gone to St. Francis to be inspired. It is said that when St Francis staged in his own simple fashion a Nativity Play of Bethlehem, with kings and angels in the stiff and gay mediaeval garments and the golden wigs that stood for haloes, a miracle was wrought full of the Franciscan glory. The Holy Child was a wooden doll or bambino, and it was said that he embraced it and that the image came to life in his arms. He assuredly was not thinking of lesser things; but we may at least say that one thing came to life in his arms; and that was the thing that we call the drama. Save for his intense individual love of song, he did not perhaps himself embody this spirit in any of these arts. He was the spirit that was embodied. He was the spiritual essence and substance that walked the world, before any one had seen these things in visible forms derived from it: a wandering fire as if from nowhere, at which men more material could light both torches and tapers. He was the soul of mediaeval civilisation before it even found a body. Another and quite different stream of spiritual inspiration derives largely from him; all that reforming energy of mediaeval and modern times that goes to the burden of Deus est Deus Pauperum. His abstract ardour for human beings was in a multitude of just mediaeval laws against the pride and cruelty of riches; it is to-day behind much that is loosely called Christian Socialist and can more correctly be called Catholic Democrat. Neither on the artistic nor the social side would anybody pretend that these things would not have existed without him; yet it is strictly true to say that we cannot now imagine them without him; since he has lived and changed the world. And something of that sense of impotence which was more than half his power will descend on any one who knows what that inspiration has been in history, and can only record it in a series of straggling and meagre sentences. 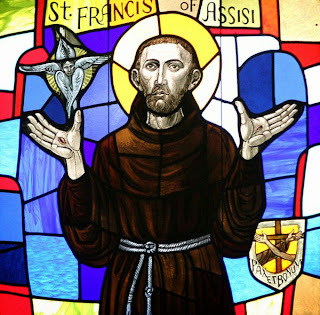 He will know something of what St Francis meant by the great and good debt that cannot be paid. He will feel at once the desire to have done infinitely more and the futility of having done anything. He will know what it is to stand under such a deluge of a dead man’s marvels, and have nothing in return to establish against it; to have nothing to set up under the overhanging, overwhelming arches of such a temple of time and eternity, but this brief candle burnt out so quickly before his shrine. G.K. Chesterton is a delight to read! I had never seen this. Thanks for posting it here.